I was at my local LFS 2 weeks ago and saw a tiny clown tang (1-2"). I've always wanted a clown tang and told the sales guy that I thought I'd be able to save him. So he practically gave him to me. I have a established 300 gallon tank that i was hoping to raise him in but soon realized that he was just to small and weak to defend himself against my juvenile hippo that is twice his size. I witnessed the hippo constantly charge and attack the clown. I immediately put the clown in a 10 gallon tank with 10 pounds of live rock. In the last week in a half the clown and seems to have flourished under my care. The problem is other than picking at the live rock the only thing he'll eat is Spirulina brine shrimp soaked in vitamins. I've tried mysis shrimp, tiny pellets, emerald entree but he only eats the Spirulina brine shrimp. Will this be adequate for now as I'm soaking the brine shrimp in ZoÃ« and Zoecon. Will the brine shrimp soak in the vitamins? 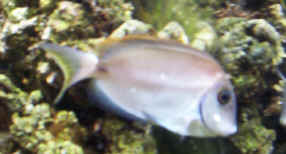 I've recently added what was supposedly an Acanthurus nubilus to my tank, but after looking at him closely, I'm pretty convinced he's really an Acanthurus thompsoni. He has the white tail, the black spot at rear base of the dorsal fin, and generally matches the few pictures I could find pretty much to the dot. What I could find, mentions this fish is a zooplankton feeder. What exactly should I offer this fish to eat, and how many daily feedings should he get? Does he eat macro algae at all? So far, he seems a lot more exited about the frozen foods (brine, emerald entree, mysis) the rest of my fish enjoy.